A strong tomato plant gets that way from a strong root system. 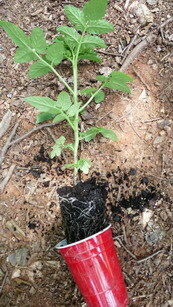 Re-potting tomato plants gives roots room to grow and strengthens the system. There are at least two clear instances when you should re-pot your tomato plants. Your tomato seedlings will have the best chance possible to develop a healthy root system when you re-pot them at least once (sometimes two or three times) before setting them in the garden. 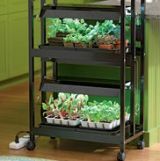 Re-pot your seedlings in cell trays when they have 2 sets of leaves and the second set is at least ½” long. Move your seedling to a bigger container, preferably a 4-6 inch pot. Bury as much of the seedling stem as possible. Watch a step-by-step video of how to transplant a seedling. Keep a careful watch on tomatoes in containers, especially during the first 3-6 weeks. 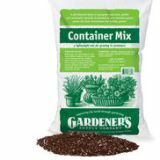 The plants may quickly outgrow their containers, particularly if the pots are 3 gallons or less in size. When your tomato gets too big for the pot or gets root-bound, it’s time to move it to a bigger container. Use the largest container possible – preferably 5 gallons or more. Read step-by-step instructions for planting tomatoes in pots. Get more info about choosing containers for tomato seedlings and choosing containers for tomatoes to set outside so you help your plants grow strong, healthy root systems. And check out tomato re-potting inspiration on our Re-Potting Tomatoes Pinterest board. 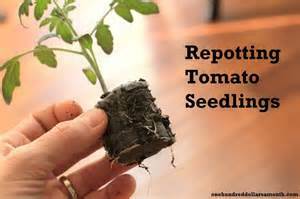 Never grab the tomato seedling or plant by the stem or leaves to transplant it. Make sure you thoroughly water the plant first. Then carefully scoop the entire soil, plus roots, into the new pot. Use a spoon to re-pot seedlings in cell trays and a trowel to re-pot tomato plants in containers. The spoon or the trowel will support the weight of the plant and the soil from the bottom. Try to keep as many roots as possible intact as you re-pot your tomato plant. You provide extra protection for the plant by lifting it from the bottom with support, rather than grabbing the stem or leaves, thereby reducing its re-potting stress. 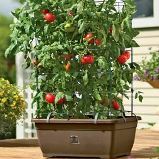 Get more fun and helpful idea for growing tomatoes on our How to Grow Tomatoes Pinterest board.